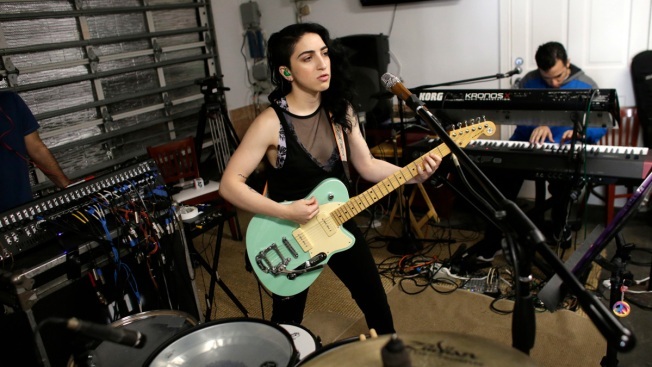 In this Jan. 31, 2017 photo, Emily Estefan practices with her band in the garage of her late grandparent's mansion in Miami Beach, Fla. Estefan, the daughter of Gloria and Emilio Estefan released her debut album," "Take Whatever You Want," on Feb. 3. Emily Estefan's debut album, “Take Whatever You Want,” has landed on several Billboard Charts. The 22-year-old daughter of music legends, Gloria and Emilio Estefan, debuted at No. 27 on R&B Current and No. 28 on Heatseekers charts, under her own label. The eclectic body of work grabs inspirations from jazz, neo-soul and funk genres and tops it off with Estefan’s smooth vocals and musicianship. "It’s the first expression where I didn’t confine myself to any barriers and you can take whatever you want from it and interpret it however you want," Estefan said of her self-written, produced and recorded album. Estefan recently played her first-ever show to a sold out crowd at the University of Miami’s Frost School of Music’s 33rd Annual Festival Miami. Estefan’s live show is making its way across the United States and is expected to make an appearance at the SXSW festival next month.